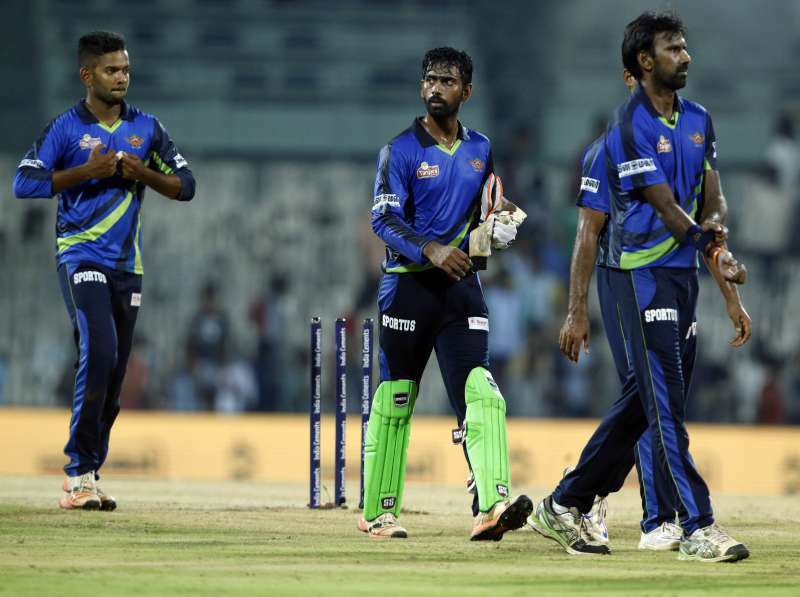 TUTI Patriots became the first ever champions of the India Cements Tamil Nadu Premier League after the Cheapauk Super Gillies were completely outplayed in front of their home crowd at the MA Chidambaram Stadium on Sunday. The home side were second best in all three departments of the game as Patriots won the game by a huge margin of 122 runs. Opting to bat first after winning the toss, half-centuries by Abhinav Mukund, Kaushik Gandhi and skipper Dinesh Karthik powered the Patriots to a mammoth total of 215 in their 20 overs before Ganesh Moorthi’s four-wicket maiden over effectively sealed the match in their favour as early as the first over of the CSG innings. Despite playing their semi-final match against Lyca Kovia Kings only on Saturday, the home team were the slight favourites heading into the final having won their previous four games and with crowd flocking to the venue for the match that was being played on the 30th anniversary of the beginning of the second ever tied Test match in cricket history between India and Australia, thirty years ago. CSG, however, were on the backfoot right from the word go as Mukund and Gandhi took the attack to the opposition with the aim of unsettling the home team which was counting on their bowling department as their biggest strength. The powerplay overs fetched 52 runs for no loss as tempers flared early on with the home side arguing with the umpires over a couple of close decisions. The needless drama seemed to affect the home side with skipper R Sathish himself losing his cool and it showed in his bowling as well as on the field. CSG's specialist new-ball bowler till the final, Sathish was forced to take himself out of the attack but there was very little he could as the Patriot openers went hammer and tongs at every bowler that came their way. The left-arm spin duo of Sai Kishore and R Alexander were the best bowlers for CSG but the fact that both of them conceded more than 30 in their quota of four overs proved how devastating the Patriots batting was. By the time the first wicket fell, they had already scored 132 runs on the board with more than six overs to spare and what followed was the Dinesh Karthik show. Armed with the license to hit, Karthik was at his innovative best, placing the ball to perfection as well as using his strength when required to clear the ropes. He brought up his half-century of just 24 balls to take the game well beyond the reach of CSG. At the other end, Mukund was at his very best as well and remained unbeaten on 82 as the Patriots total went past the 200-run mark. The home team needed a spectacular start to have any chance of a victory and their leading batsman from the tournament, Thalaivan Sargunam, attempted to do just that dancing down the track off just the second delivery of the first over. Unluckily for the batsman, the miscued shot was caught spectacularly by Subramanian Anand to spark off a truly unbelievable over. Ganesh Moorthi went on to pick the second hat-trick of the tournament as he sent back Gopinath, R Sathish and U Sasidev off the final three deliveries of his maiden over. Four wickets down with no runs on the board, even the most ardent CSG fan would have had to admit that the match was beyond them. Brief scores: TUTI Patriots 215/2 off 20 overs (Abhinav Mukund 82*, Kaushik Gandhi 59, Dinesh Karthik 52) beat Chepauk Super Gillies 93 all out by 122 runs.